We investigate the construction and application of parallel software caches in shared memory multiprocessors. 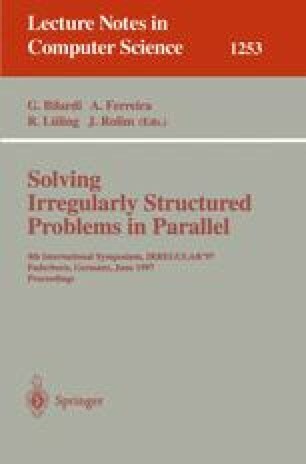 To re-use intermediate results in time-consuming parallel applications, all threads store them in, and try to retrieve them from, a common data structure called parallel software cache. This is especially advantageous in irregular applications where re-use by scheduling at compile time is not possible. A parallel software cache is based on a readers/writers lock, i. e., multiple threads may read simultaneously but only one thread can alter the cache after a miss. To increase utilization, the cache has a number of slots that can be updated separately. We analyze the potential performance gains of parallel software caches and present results from two example applications. The first author was supported by the German Science Foundation (DFG) under contract SFB 124, TP D4.